Noordwijk/Netherlands, 7 February 2018 - The European Space Agency (ESA) and Airbus have signed a commercial partnership (PPP) agreement for construction, launch and operations of the commercial "Bartolomeo" platform. 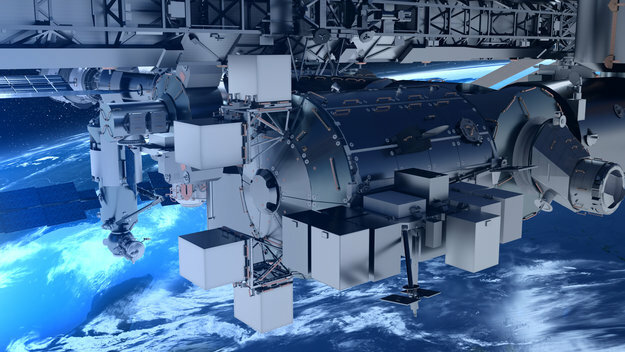 Airbus' new external payload hosting facility will be attached to the European Columbus module of the International Space Station (ISS) from mid-2019. The agreement defines the roles and responsibilities of the two PPP partners, with Airbus investing around €40 million into the development, construction and launch of this innovative platform, and ESA providing Bartolomeo’s installation on the ISS. Bartolomeo will be launched in the unpressurized compartment of an ISS supply vehicle and installed using the ISS robotics system and an extra-vehicular activity. Airbus is then responsible for platform operations and payload integration. These new, commercially available opportunities are open to users world-wide, coming from areas including Earth observation, technology demonstrators, astro- and heliophysics, material science, new space flight applications and commercial missions. “Our role is to make access to low-Earth orbit as easy as it possibly can be and open up the ISS to a global user community,” said Oliver Juckenhöfel, Head of On-Orbit Services and Exploration at Airbus. “We are creating a cost and time efficient way for institutional and private organizations to bring their experiments into space as external payloads. We can get them launched just 18 months after signing a contract. With our All-in-One Space Mission Service, the Bartolomeo users can concentrate on their payload, while we take care of everything else, from launch and installation, to in-space operations, communication links and even all the way to returning the experiment to Earth if it is required,” he continued. Named after the younger brother of Christopher Columbus, the Bartolomeo platform will offer 12 payload slots on the outside of the Columbus module. The growing number of commercial space users for payloads in the 100kg class is driving demand. The payloads do not require hands-on maintenance by astronauts and can be operated outside of the ISS. The platform development has recently passed the preliminary design review and is on track for launch in May 2019. First payloads are then expected to be installed in the second half of 2019. Key to offering a service for smaller payloads is the General-purpose Oceaneering Latching Device (GOLD) – a new attachment mechanism for payloads of up to 125kg and 0.5 m³ developed by Airbus’ partner Oceaneering Space Systems in Houston, Texas. 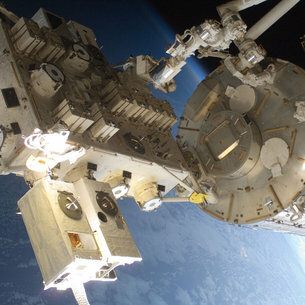 The two companies are also working on the system to attach the platform to the Columbus module using ISS robotics. 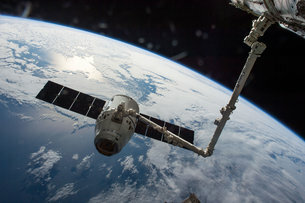 Quick access to space, high-speed data feed and a unique vantage point are the selling points of a new commercial venture on the International Space Station. Its name is Bartolomeo, and its versatile design allows for many mission types at competitive prices from next year. The Space Station has been growing in size during the past 20 years, and so have the number of platforms dedicated to science in orbit. However, researchers and engineers are finding it harder to acquire slots for their experiments. A decade after its launch, Europe’s Columbus laboratory makes room on the outside to a new platform that offers an affordable, quick and easy access to space. Bartolomeo aims to attract new European users to the Station, including a community of start-ups and space entrepreneurs. As companies piggyback off existing Station resources to reduce cost, new commercial opportunities will arise. Earth observation and telecommunications, exobiology and space weather research are areas of great demand that will benefit. 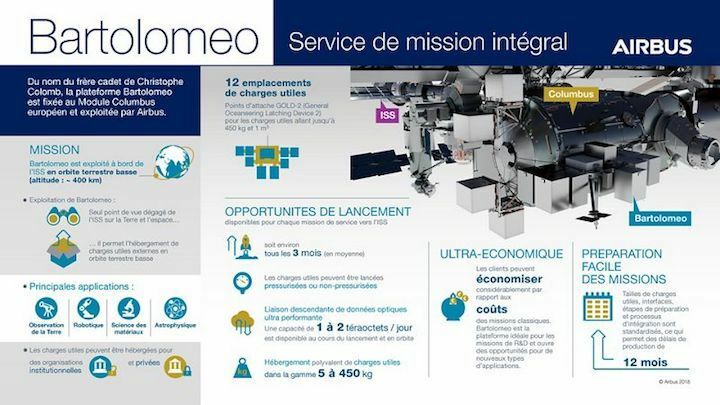 The Bartolomeo All-in-one Mission Service will provide end-to-end access for external payloads on the Station. It provides unobstructed view of Earth, direct control of the experiments from the ground and the possibility of retrieving samples. Today, ESA and Airbus Defence and Space signed a commercial partnership that will make Bartolomeo a reality next year. While the European company funds the development and promotes commercialisation, ESA will support the launch, installation and operations. This is the first time that a European commercial partnership is offering the opportunity to carry out science and demonstrate technology outside the Station. The Bartolomeo platform, named after the younger brother of Christopher Columbus, will be mounted on the forward side of Columbus, 400 km above Earth. Users will enjoy a data downlink capacity of 10 Gbit/s – enough to download a high-definition movie within 30 seconds. The formula for payload size is flexible. Users can squeeze in as little as 5 kg by sharing the ride with other experiments, or have an entire slot of up to 450 kg at their disposal. Bartolomeo offers 11 slots, and the waiting time from the moment a contract is signed and the ‘go for flight’ is one to two years – much shorter than the standard timeframe for experiments. The rental agreement in space is for a minimum of one year. Bartolomeo is set for launch in 2019 on a SpaceX Dragon cargo ferry.